Most people get to see only the finished product but I got chef Alfredo Marzi, the director of culinary operations for all of the Princess ships, to take me below deck, past a number of No Passengers Allowed signs to show me exactly how you feed 5,000 people three meals a day when the nearest grocery store is hundreds of miles away. Beyond some foot-thick steel doors I found specialized rooms for everything from vegetable peeling to seafood defrosting, and more raw ingredients than I thought possible to fit in one place. Here’s where the magic happens. 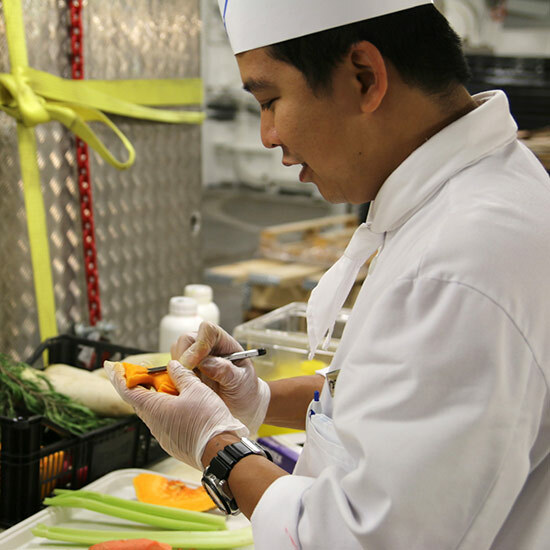 Let’s just start with the stats: 300 people work on the culinary side of the ship’s operations, feeding up to 3,500 passengers, and almost half that many crew members. (With its own mess hall, the crew also has its own menus, which always include simple pizzas and, interestingly, Filipino fare, because so many staffers hail from the Philippines.) The Regal Princess has 14 kitchens, plowing through up to 17 to 18 tons of foodstuffs per day. And what if the engines blow and you’re stuck out on the open ocean? (I tried not to think about that hypothetical too long.) “We have to be able to feed everyone on board for an additional week, as a contingency plan,” Marzi says. Plan those menus three months in advance. If you sell food, supplying a whole ship is a pretty great gig. So not only do suppliers have to bid for contracts, they have to guarantee the supply a year in advance, regardless of circumstances. “If they’re a day late and can’t meet the ship, then they’re obligated to fly all that pork or seafood and meet us at the next port. And clearly, that’s not cheap,” Marzi says. Better to make it than buy it. How do you keep bread fresh for a week at sea? You don’t. You bake it. “We make everything on board,” says Marzi, “from the ice cream, to the pralines in the ice cream.” So there’s an entire baking staff working around the clock, making pastries for the cafés and the dinner rolls on every restaurant plate. Even building blocks like stocks are made on board. There’s a whole team to prepare the hundreds of pounds of raw vegetables the kitchen races through every day, and a team just to manage the meat defrosting. (It’s not like you can just thaw 2,000 steaks in the microwave if you didn’t get the timing right.) Each team’s specialized area is larger than most restaurants’ entire kitchens and walk-ins. And then there’s this guy, my favorite: the team’s food artist. Here, he’s carving a butternut squash; later in the day, it might be a watermelon sculpture. Seems like a good life, sailing around the world and making art out of fruit. And guard the precious cargo. Everything from crates of beer to lobsters and oysters are kept in their own walk-ins, but only a very few ingredients are under lock and key. Marzi had me guess what was held in the single locked cabinet. I nailed fois gras and caviar, but those high-end ingredients weren’t all that needed protection. “Somehow, the Nutella and Oreos just always go missing,” he says. Even with an endless supply of top-quality ingredients, people always find their way back to Nutella.